(Nanowerk News) Researchers at the Universities of Zurich and Cambridge have discovered a new, exotic class of planets outside our solar system. 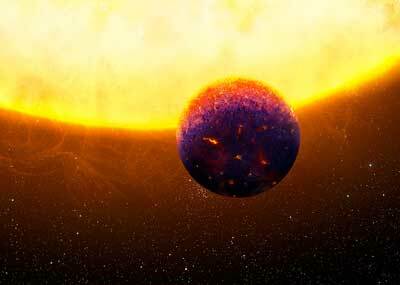 These super-Earths were formed at high temperatures close to their host star and contain high quantities of calcium, aluminum and their oxides – including sapphire and ruby. Twenty-one light years away, in the constellation Cassiopeia, a planet by the name of HD219134 b orbits its star with a year that is just three days long. With a mass almost five times that of Earth, it is what is known as a super-Earth. Unlike our planet, however, it most likely does not have a massive core of iron, but is rich in calcium and aluminum instead. "Perhaps it shimmers red to blue like rubies and sapphires, because these gemstones are aluminum oxides, which are common on the exoplanet," says Caroline Dorn, astrophysicist at the Institute for Computational Science of the University of Zurich. HD219134 b is one of three candidates likely to belong to a new, exotic class of exoplanets, as Caroline Dorn and her colleagues at the Universities of Zurich and Cambridge now report in the British journal MNRAS ("A new class of super-Earths formed from high-temperature condensates: HD219134 b, 55 Cnc e, WASP-47 e"). The researchers use theoretical models to study the formation of planets and compare their results with data from observations. It is known that during their formation, stars such as the Sun were surrounded by a disc of gas and dust in which planets were born. Rocky planets such as Earth were formed out of the solid bodies left over when the proto-planetary gas disc dispersed. These building blocks condensed out of the nebula gas as the disc cooled. "Normally these building blocks are formed in regions where rock-forming elements such as iron, magnesium and silicon have condensed," explains Dorn. The resulting planets have an Earth-like composition with an iron core. Most of the super-Earths known so far have been formed in such regions. But there are also regions close to the star where it is much hotter. "Many elements are still in the gas phase there and the planetary building blocks have a completely different composition," says the astrophysicist. With their models, the research team calculated what a planet being formed in such a hot region would look like. They found that calcium and aluminum are the main constituents alongside magnesium and silicon, and that there is hardly any iron. "This is why such planets cannot have a magnetic field like Earth," explains Dorn. And since the inner structure is so different, their cooling behavior and atmospheres will also differ from those of normal super-Earths. The team therefore speak of a new, exotic class of super-Earths formed from high-temperature condensates. "What's exciting is that these objects are completely different from the majority of Earth-like planets," says Dorn – "if they actually exist." But it's very likely they do, as the astrophysicists explain in their paper. "In our calculations we found that these planets have 10 to 20 percent lower densities than Earth," explains the first author. The team also analyzed other exoplanets with similarly low densities. "We looked at different scenarios to explain the observed densities," says Dorn. For example, a thick atmosphere could lead to a lower overall density. But two of the exoplanets studied, 55 Cancri e and WASP-47 e, orbit their star so closely that their surface temperature is almost 3,000 degrees and they would have lost this gas envelope a long time ago. "On HD219134 b it's less hot and the situation is more complicated," explains Dorn. At first glance, the lower density could also be explained by deep oceans. But a second planet orbiting the star a little further out makes this scenario unlikely. A comparison of the two objects showed that the inner planet cannot contain more water or gas than the outer one. It's still unclear whether magma oceans can contribute to the lower density. "We've thus found three candidates that belong to a new class of super-Earths with this exotic composition," the astrophysicist summarizes. The researchers are also correcting an earlier image of super-Earth 55 Cancri e, which had made headlines in 2012 as the "diamond in the sky". Researchers had previously assumed that the planet consisted largely of carbon, but they had to discard this theory on the basis of subsequent observations. "We're turning the supposed diamond planet into a sapphire planet," laughs Dorn.